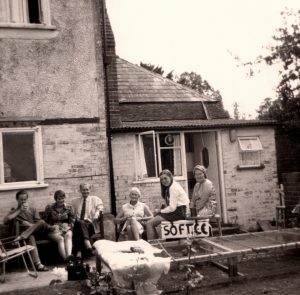 Catherine Mary Felicity Man (Felicity) was born on 12 June 1913 at 12 Lancaster Place, London, NW, the daughter of Edward James Fowle Garnet and Beatrice (Crofts) Man. Felicity married Stephen Barton Durnford in 1943. They were divorced. Felicity’s brother John Man married Stephen’s sister Peggy. She was known as Felicity and lived at Benenden and Ewhurst Green, near Bodiam. She died on 30 May 1977 at Hawkhurst Cottage Hospital, Kent. Stephen Durnford was born on 21 November 1914 at Bickley, Kent and died on 6 April 1993. Felicity and Stephen belong to Man Generation Ten; their two sons and one daughter are living and belong to Man Generation Eleven. 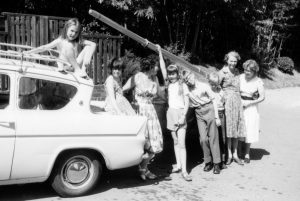 From Left to Right: 1960 – Jane Durnford (sitting on car roof); Kate Man; Pam and Iona McMillan; John Man; David Man; Eleanor (Man) Lloyd and Felicity. NOTE: Pam McMillan was the owner of the car and the boat. She was the office secretary for Man & Durnford Ltd., whose farming business was based in Bikkel [sic]. 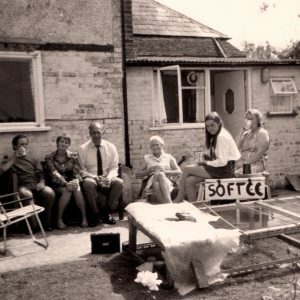 In 1968 Felicity moved from Bikkel in Benenden to Chapel Cottage in Ewhurst Green. These three photographs were taken at Chapel Cottage. 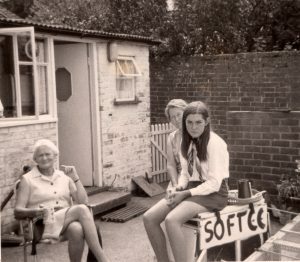 On the far left (holding a mug) is Dickie Man taken just before he and Sue went to South Africa to attend Rob’s wedding to Jacqui. Softee was a rabbit – silver rex – originally called Mr Softee until she had kittens. Henry Man with tie, no Jacket. John Man with tie and jacket (middle photo). Peggy (Durnford) Man (white hair/white dress). Felicity and her daughter Jane.